Payouts of nearly £1m to directors of Wales' biggest supply teaching provider have been dubbed "obscene" and "disgusting" by opposition AMs. The dividends were given to two founding members of the Cardiff-based firm New Directions over two years. Profits in its education subsidiary doubled after it won a deal meaning all Welsh schools were expected to use it. The company said it offered value for money with the lowest profit margins of any agency in the sector. New Directions operates a number of subsidiaries but a breakdown of accounts lodged in Companies House for 2015-16 and 2016-17 show the majority of profits were made in education. In 2016-17, New Directions Education, which on a typical day will place around half of the supply teachers used by schools across Wales, made a profit of £726,442. In 2015-16, the directors Jeff and Zoe Tune were given dividend payouts of £430,000 and in 2016-17 they received £464,000 - a total of £894,000. In 2016-17, they were also given additionaly payments of £22,000 each. Profits in 2015 doubled when the company was awarded the contract to be the main supplier with the National Procurement Service, a body set up by the Welsh Government to try to cut costs for the public sector. There was no compulsion to use New Directions but a Welsh Government document at the time said local authorities expected schools to use the company. In 2014-15, New Directions Education made a profit of £292,740 but then in 2015-16 as the new procurement contract got underway it made a profit of £583,321. Plaid Cymru's education spokesman Llyr Gruffydd: said: "At a time when head teachers are telling us that schools are on their knees due to financial pressures, it's obscene that a private company has profited so dramatically from the government's procurement policies. "Schools are losing out, supply teachers are losing out and the only people who appear to be benefiting are the two shareholders of this company. "Plaid Cymru has long advocated a different approach, with options including a national not-for-profit agency for supply teaching." Welsh Conservative leader Andrew RT Davies said: "I think most people would be pretty disgusted with those levels of remuneration, especially when schools are struggling to fill full-time teaching positions and teaching assistant positions as well. "Across our public services there is a huge issue about getting full-time staff in and nurturing those full-time staff to be integral members of the team. That falls straight flat at the door of Welsh Government," he added. There have been concerns about the pay and conditions of supply teachers in recent months with campaigners claiming the use of agencies has led to lower wages. But New Directions, which won the Welsh Government Supplier of the Year award in 2015 and 2016, insisted it only makes a net profit of 4% after paying the teachers and taking out its own costs. Gary Williams, a director of business development at New Directions, said it is more efficient at providing supply teachers than local authorities who used to do the job. He said: "We are a business - we want to make money but a lot of the money gets reinvested, such as in our training facility. "This contract that we operate has made huge savings for Wales over the years and the simple fact is the value for money the schools get is second to none. "If Plaid Cymru were to speak to the schools and the teachers I am sure they would get a different kind of feedback." 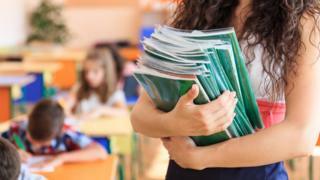 A spokesman for the Welsh Government said: "There is nothing to prevent school governing bodies and local authorities from commissioning and deploying supply teachers via alternative arrangements including via direct employment."